A theme wedding is as much fun for the guests as it is for the bride and groom. 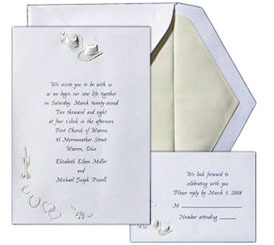 It's very natural for couples to want their invitations to be as unique and trendy as their ceremony and reception that they are planning. A western style invitation, instead of a traditional invite would be a lovely preview for your guests to know what to expect on your wedding day. Who knows, some of your guests may come dressed with a cowboy hat or gauchos! The above invite featuring a cowboy hat and horseshoes conjures up thoughts of the Wild West and a "rootin, tootin," knee slapping, good ole time. So let the fun begin! Since you and your fiancée have lassoed each other in love, how about having a picture of a lasso with two hearts in the center to express your commitment to each other. Have a "Wanted Sign" printed on the front of your invite with "We're tying the knot" as a cute saying. Your invitation could have a picture of an old town complete with a saloon and a horse hitched out front. I'd use parchment paper with singed edges to give your invitation an authentic country western feel. Another idea is to have a picture of a guy and gal ridding on a horse into the sunset. One bride that I know sent invites with an etching of a young girl and a little boy holding wild flowers in his hand. Next to them was a split rail fence with overgrown grass and yellow flowers growing in the hillside. Some country theme invitations that I have come across, feature an older gentleman playing a fiddle with a barnyard in the background. Spurs and rope printed on a light brown invite, announces that, this is going to be a fun filled, serious western theme shin dig. The font of your text is another important factor to consider. I recommend a block lettering for your invites. Get more ideas for your western theme wedding invitations by looking through invitation books at a card store and Internet web sites. You can also take a ride to your local library where you can look at some old country bridal books to get additional authentic inspiration. For more tips and information come browse my Welcome page. Need more invitation ideas? Check out the links below.